An unprecedented series of wildfires is sweeping across California, and photos and videos have captured the devastation, as 14,000 firefighters work to battle the flames. 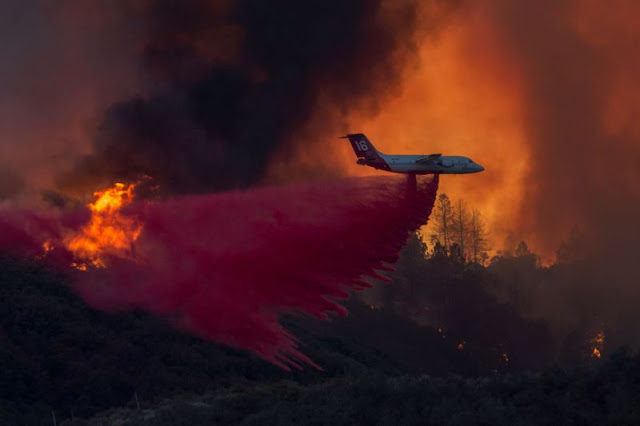 The Holy Fire started on Monday in Cleveland National Forest near Orange County, prompting mandatory evacuations and spreading more than 4,100 acres as of Wednesday morning, when it was 5% contained. One American Airlines passenger, Vanessa Kuo, captured a video showing giant clouds of smoke beneath her plane during a flight from Los Angeles to Boston on Monday afternoon. There are currently more than a dozen wildfires burning throughout the state. The Mendocino Complex Fire in Northern California has become the largest in the state’s history, burning since July 27. As of Wednesday morning, it had covered more than 300,000 acres and was 47% contained. Astronauts have also shared images of the California wildfires as seen from the International Space Station. NASA astronaut Ricky Arnold described “plumes of billowing smoke” rising over California, sharing photos on Twitter on Monday. “It is truly heart-rending to witness,” Russian cosmonaut Oleg Artemyev said in a tweet on Tuesday. 0 Response to "This Is What a California Wildfire Looks Like From 30,000 Feet"